This is less of a tutorial and more of a public service announcement. You can record using REAL microphones using your iPad and an M-Audio Fast Track. First, you’ll need the iPad camera connection kit, a $29 accessory that comes with two pieces. One is for reading SD cards, the other is a plain USB port. Both attach to the dock port at the bottom of the iPad. Many people have discovered that the plain USB connector seems to support much more than cameras, and USB microphones is among those undocumented features. As long as the USB audio device is class-compliant (meaning it doesn’t require custom drivers on Mac OS X), it should work, so I thought I’d try this out with my Fast Track. And guess what? It works! I attached the camera connector to the iPad, plugged the Fast Track in. Sometimes, the iPad will reject the device, saying it’s not supported, but usually after a couple tries the Fast Track will light up and take over the audio system of the iPad. I say “take over” because there is no Audio preference panel. There is no system-wide setting that routes audio as there is on a desktop OS. Instead, when the Fast Track is connected, all audio is routed to and from it (unless the app is written in such a way that it is ignored – most apps will recognize it). This means you’ll have to plug your headphones into the Fast Track rather than the iPad. I tested mine using a stock Shure SM58, and it worked beautifully. I have not tried connecting a condenser mic, and will update this post when/if I get a chance. 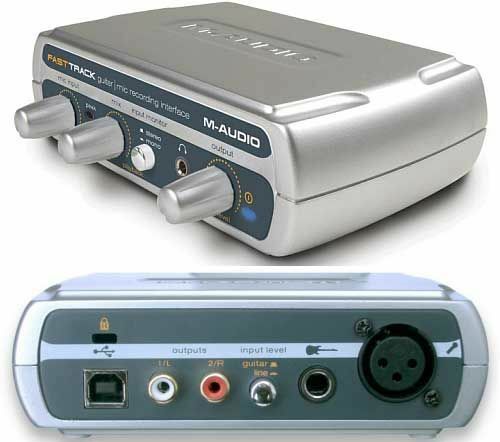 I’m fairly positive any USB audio device (as long as it’s class-compliant) will work using this method. The only exception is when a device draws too much power. The iPad will simply refuse to connect to a USB device that is drawing more than a small amount of power. I suspect that devices with phantom power (+48V) output will need to be tethered to an external power source before connecting to the iPad to make them work. I tested this using Retronym’s Recorder app, a simple recorder written for the iPhone. Many audio apps are being updated as of this writing to support the USB audio feature of the camera kit. Hello thanks for this article. I had tried using my Fast Track with the iPad with no results without realizing a hub would make it work with external power. However I can only get the mic input to work not the guitar input. Also all my apps send audio out from it in crystal clear stereo except iKMultimedia,s Amplitube all version Free and paid. I would like to get the guitar input working since Iam a guitarist. Thanks again for the post. Yeah, it seems the behavior is different since the 4.2 upgrade. I’m hoping some more interface options come along to check out!